Don’t you love a lazy Sunday? 8:35 am – Drip, drip, drip. My favorite thing to see when I stumble into the kitchen. 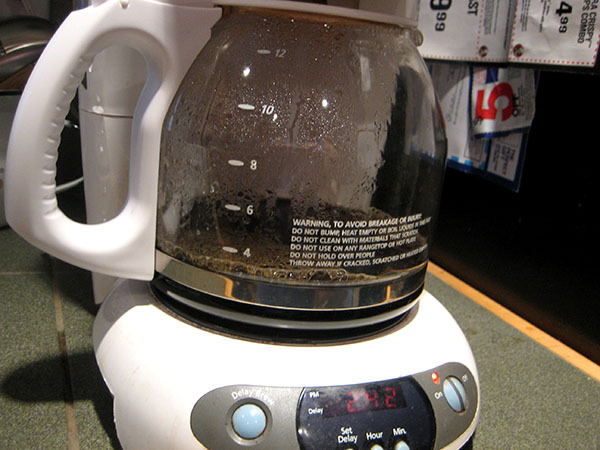 No, we don’t keep the clock set on the coffee pot. I try to remember to unplug it to save energy. 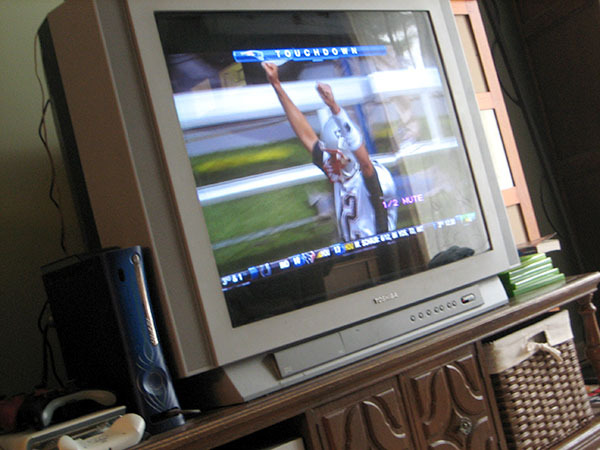 11:54 am – Jason must have someone from one of these teams on his fantasy team. 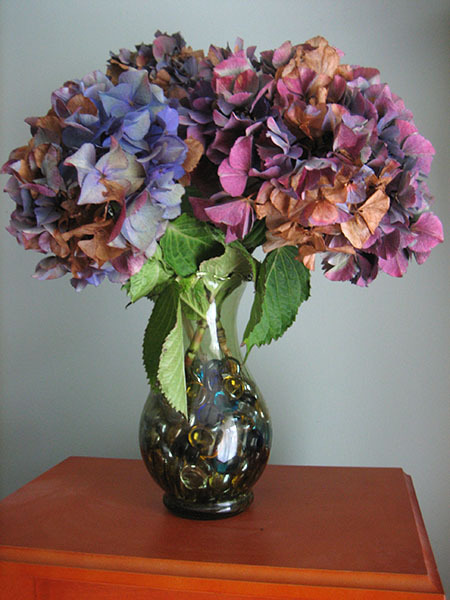 1:06 pm – I love these dying hydrangeas from the front yard. 1:06 pm – …and these fresher ones. From the same bush. There’s great contrast out there right now. 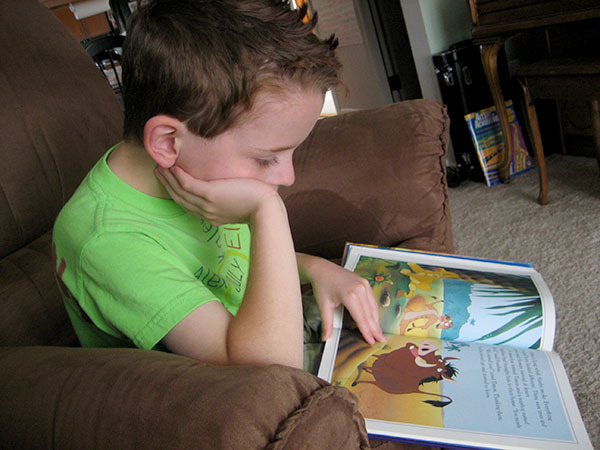 1:16 pm – Reading time. Some books never get old. 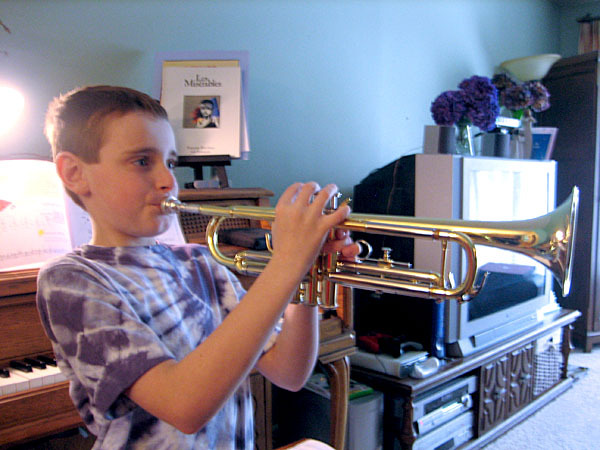 2:58 pm – Nicolas had his first trumpet lesson on Saturday. This picture makes me so happy. 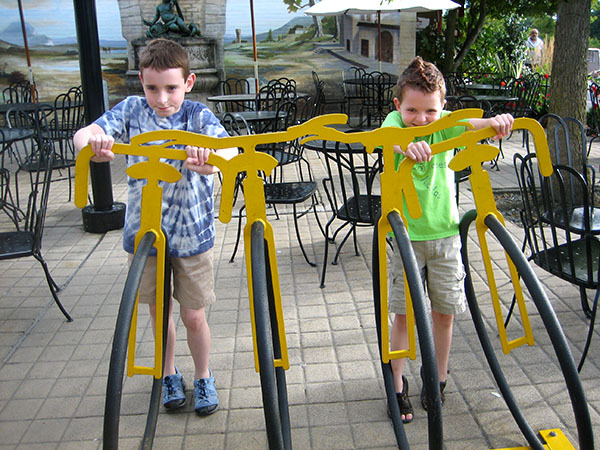 4:57 pm – Bicycle racks shaped like bicycles! Cute, until your goofy mom insists you pose with them for a photo. That’s going on her blog. At least Kalen seems to be going for it. 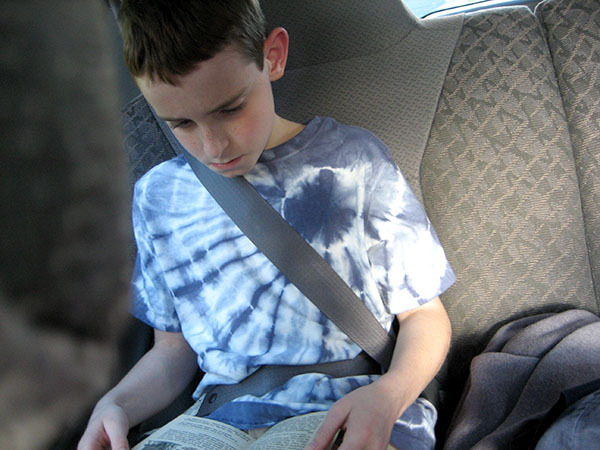 5:07 pm – He is really into this book. He maintained this position for the entire ride. Note the death grip on his new bookmark. 5:07 pm – Nicolas got a few new-to-him Choose Your Own Adventures. Vintage 1980’s! 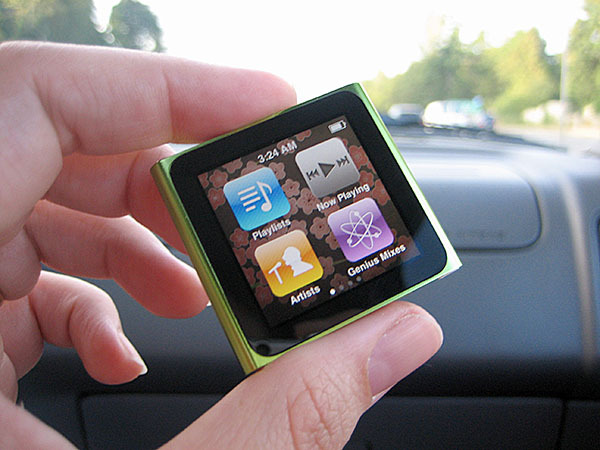 6:29 pm – Playing with my new toy after a stop at the mall. 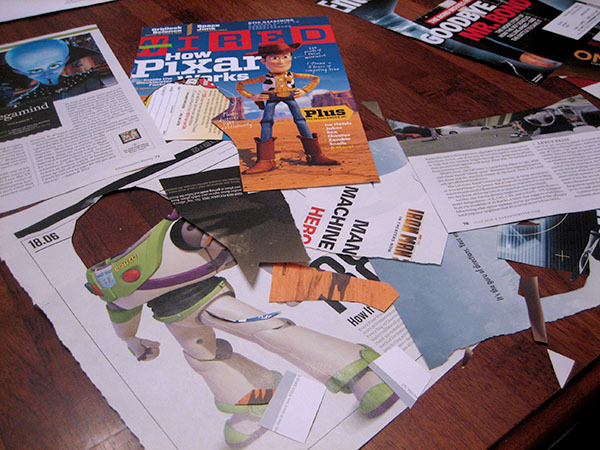 8:21 pm – The aftermath of a collage assignment for school. And that was our 12th! A much-needed day of relaxation. Check out how the rest of the world wiled away their Sunday over at Chad’s. Love it! I’m sad that the kids are starting to outgrow those shirts. You know what that means…Time to get together again so I can make new ones! 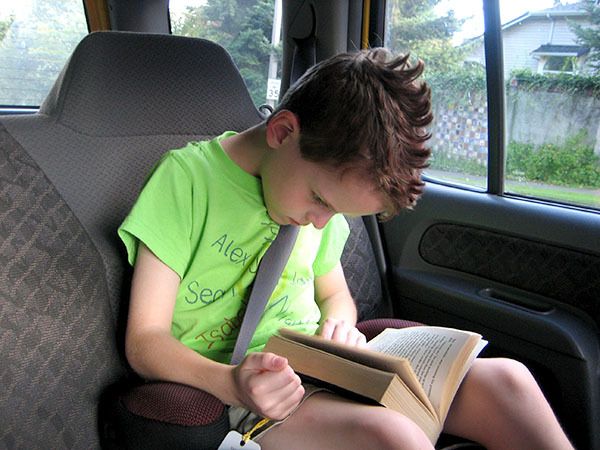 I am amazed (and jealous) that anyone can read in a moving vehicle – I would love to be able to get into a book with that kind of intent!!! I did it! I did it! I got 12 of 12 and blogged it 🙂 Loved your lazy Sunday. Mine was just a bit busier. 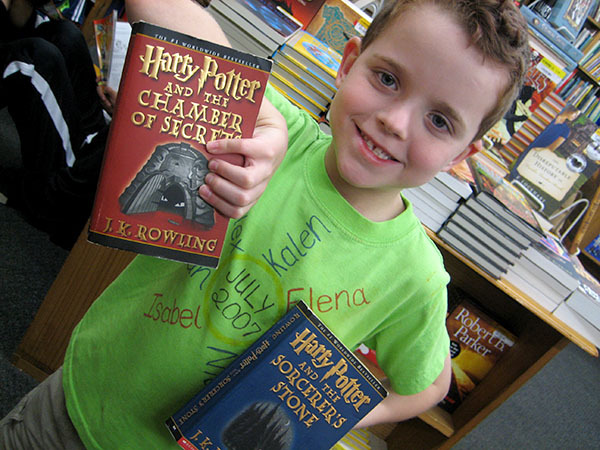 I love that Kalen is into HP. Jacob loves them, but I haven’t started them with Nate yet. 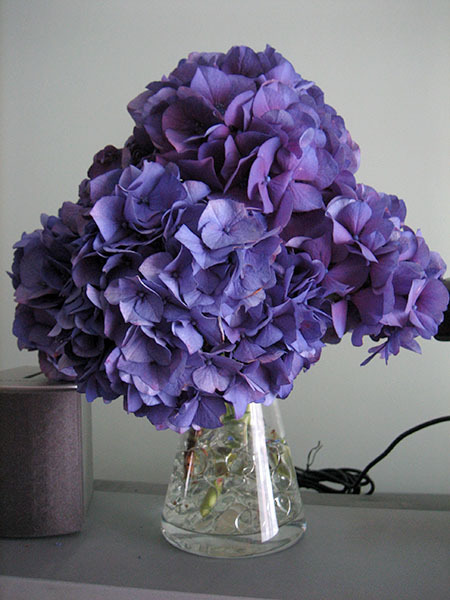 The hydrangeas are awesome – we have a ton in the backyard, would love to dry some one of these days. Oh, I LOVED the Choose Your Own Adventure books!!!! Looks like a wonderful day. Thanks for sharing.